Where centuries ago man relied on leather as a necessity for clothing and shelter, modern times showcase leather almost as a status symbol. A home with leather upholstered furnishings and a car with leather seats may indicate wealth, while a leather jacket worn by a celebrity evokes an image of rebellion. High-quality bound books, footwear, apparel, and briefcases are just a few items one can find made with tanned animal hide, which brings in nearly $50 billion dollars annually in global trade. 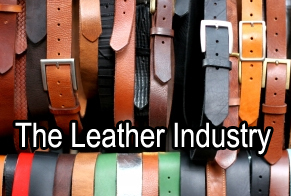 Considered a sub-industry of the cattle and livestock trade, the leather industry is perhaps one of the most versatile. Leather may be tanned and preserved using different methods, dyed a variety of colors, and used for anything from sporting goods to protective covers to fashion accessories. Tastes and styles will vary, but leather remains a premium commodity for retailers around the world. According to the BLC Leather Technology Centre, the average consumer may have as many as four leather-made items on person or in use daily. According to the International Council of Tanners, 65 percent of global leather production goes into footwear. Of an animal’s total value, only ten percent comes from the hide used to make leather. The oldest leather shoe in the world is believed to be 5,500 years old, found in Armenia. Brazil – This South American economic leader is a large exporter of cattle and by-products, and consequently top leather exporter. The privately held company Bertin S.A. is one of the country’s largest producers. Bangladesh – Bangladesh is home to Apex Tannery Ltd., an important player in the industry. Leather International reported in 2001 that the company produces and exports 2.5 million feet of leather hide monthly. Major importers include Italy and Hong Kong. China – As a major exporter of footwear and apparel, China has a strong hold in the industry. Vietnam – This developing economy is fast becoming an important figure in the industry. China Leather Net reported that in 2012 the country’s leather footwear exports rose over 40 percent from the previous year. Though leather products remain high in demand around the world, the industry does not operate without challenges and detractors. In South America, for example, the growing cattle industry has led to deforestation, which threatens the global eco-system. Bertin S.A. of Brazil is one company dedicated to helping find a balance and preserving the forests. Chemicals used to tan and preserve leather are also known to cause environmental damage. In recent years, however, some factories have turned to eco-friendly methods that recycle water used in the process and reduce waste. Chinese companies, according to Treehugger, have utilized systems that have reduced waste by 40 percent. Animal rights remain a concern in the industry as well. Organizations like People for the Ethical Treatment of Animals continue to appeal to clothing manufacturers to utilize animal-friendly alternatives to leather, while in India an illegal leather trade thrives in a nation where cows are sacred. Nonetheless, leather remains an irreplaceable commodity since the barter trade era and forms a billion-dollar global industry that works in tandem with automotive manufacturers, clothing designers, and markets that produce accessories for computers, fashion, and publishing needs.